Spring has been slow to arrive in Rhode Island, and the water temps are even slower to warm up here. We’re lucky that we can watch the airfares and grab a cheap fare to Florida where the water is always warm. But what do we do when we’ve scheduled a trip and the weather doesn’t cooperate? Diving in the ocean in inclement weather is difficult and often dangerous. Offshore winds stir up the waves to the point where it makes being in a dive boat hazardous. Imagine a wave knocking a scuba tank onto your feet. No fun, right? So we got down to Florida and Googled. We needed to find a dive site that would be away from the nasty offshore weather and still be interesting. 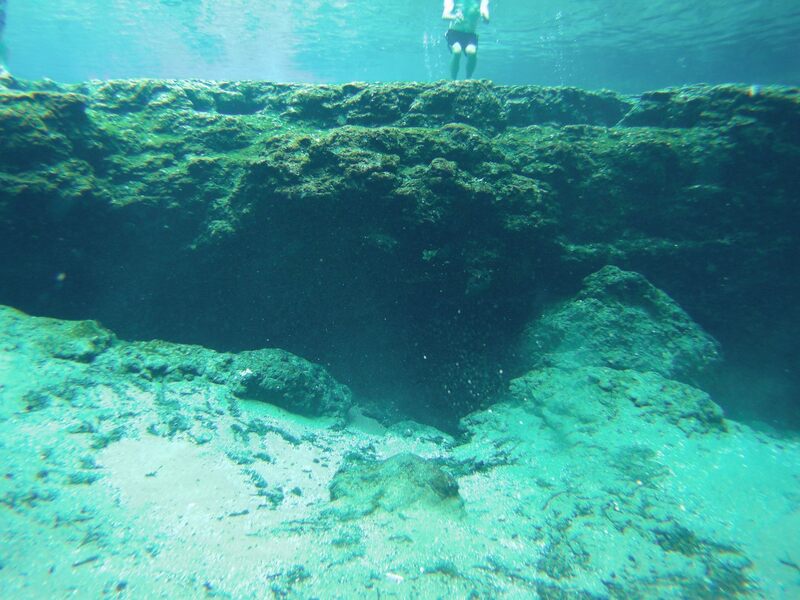 That’s when we discovered Ginnie Springs. Ginnie Springs is located in High Springs, just north of Orlando. We drove the four hours to get there and we quicklynoticed that Ginnie Springs is a local attraction. Camp sites clustered along both sides of the dirt road, which opened out into a large parking area where people played volleyball on the sand court. Cars and trucks with music blasting had people and inner tubes hanging out the windows and off the roof, trunk and hood, barreled by us and parked in any available spot along the sides of the road. We rented tanks, and assembled our gear at a picnic table. Then we waddled over to the entry point at Devil Spring, which is an off shoot of the Santa Fe River. The thing with diving in a spring is that the water comes up from below, then the spring flows into the river. As we descended into Devil Spring, we felt the current come at us from below, and it gently blew us toward the surface as we tried to descend. 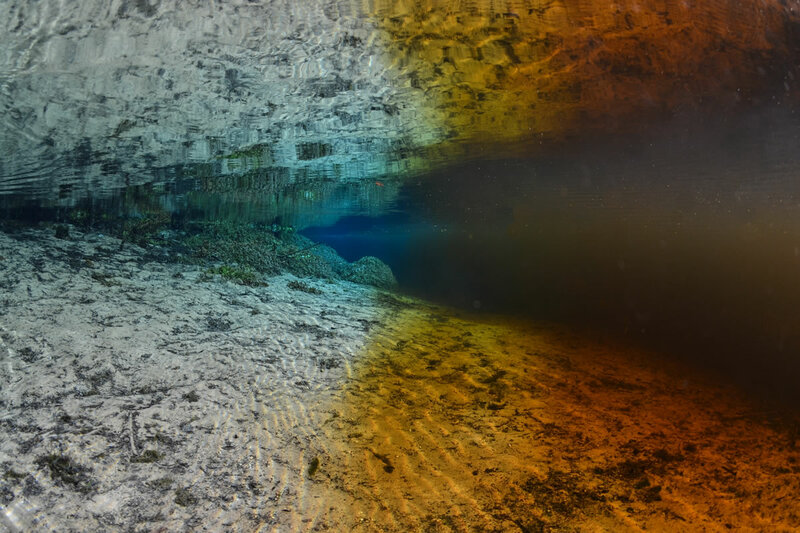 The springs flow into the Santa Fe River—at that point we could see the clear water of the spring collide with the brownish tannic water of the river in a distinct line where clear water met tea. 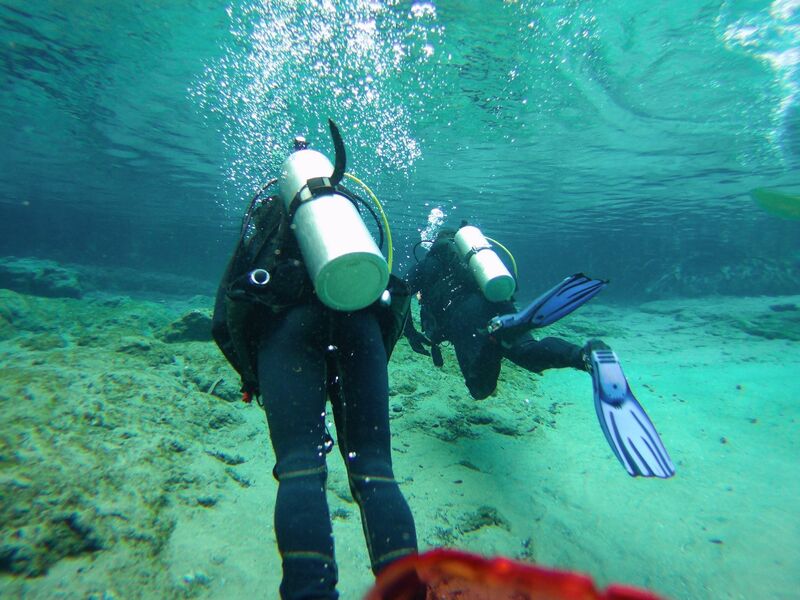 I didn’t take this picture, it’s on the web site for Ginnie Springs. But we saw this where Devil Spring meets the Santa Fe river, and we could see the line where the two kinds of water collided. 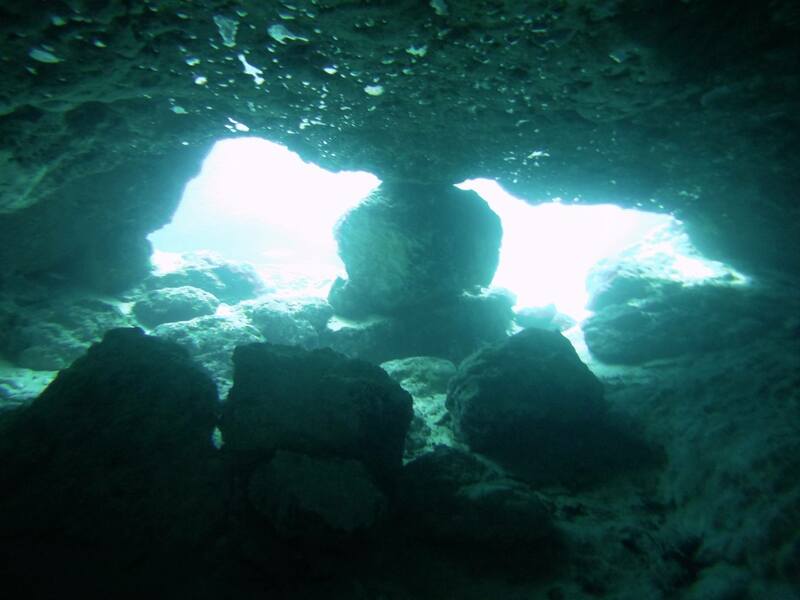 Here are some pictures that we took along the two dives, at Devil Spring and Ginnie Spring. 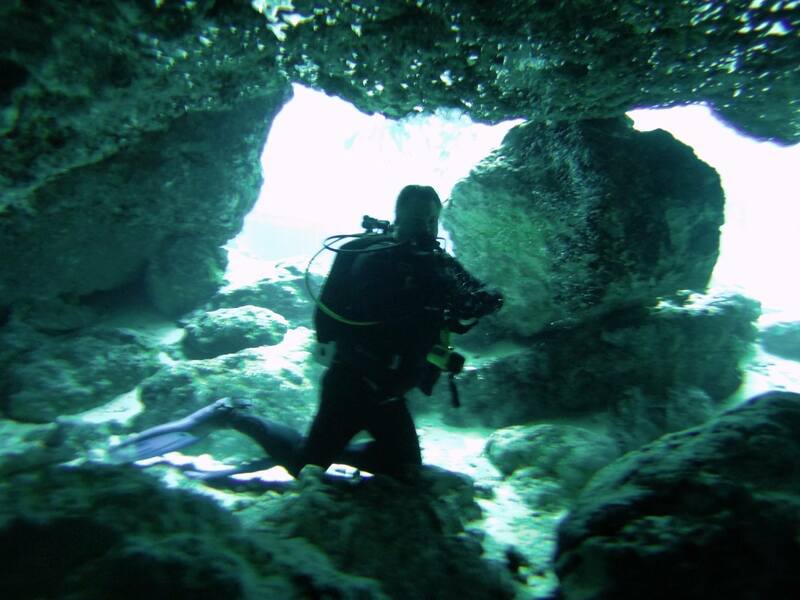 At Ginnie Spring there was an underwater cave, more of a cavern as it’s larger than a cave, we were able to swim into and check out the rock formations. This is from the inside of the cavern looking out. You can see our air bubbles collecting on the ceiling of cavern, those splotches that look like mercury? That's air. The area in the shadow under the rock ledge is how you enter the cavern at Ginnie Spring. This is in Devil Spring. The water goes deep, then shallow, then deep again. There were people floating above us. At one point our friend Brian, who was diving with us, was submerged under some women who were tubing. I was at the surface and I heard one woman say, with a slight shocked tone in her voice, to the other "There is a man. Under. Me." This is at Devil Spring, from the bottom looking upward. There is a cave system that extends off from here that we are not allowed to dive because none of us have a cave diving certification Cave diving is a whole different animal, as it requires diving in confined spaces, to the point where the tank can't even be on your back because with it you may not fit in narrow passages. 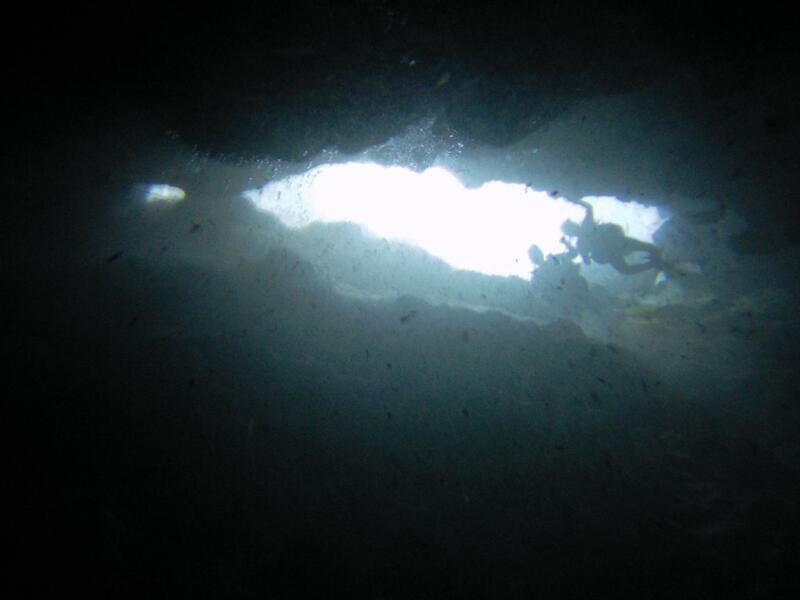 Overall, an awesome dive with crystal clear visibility that is off the beaten path. I recommend mixing up diving with camping and tubing along the Santa Fe river too.